JUMP ON HERE THE VISION #8 "LITTLE BETTER THAN A BEAST" STARTS NOW! The most critically acclaimed series of the year continues. The Avengers know. They know his wife killed the Reaper and the boy. They know Vision lied to protect her. They know that those lies will lead to more lies, those deaths will lead to more deaths. What do you think? Full Marvel's June 2016 solicitations here. I gotta' read those spoilers, 'cause that Vision synopsis is crazy. So is he drifting into villain territory now? 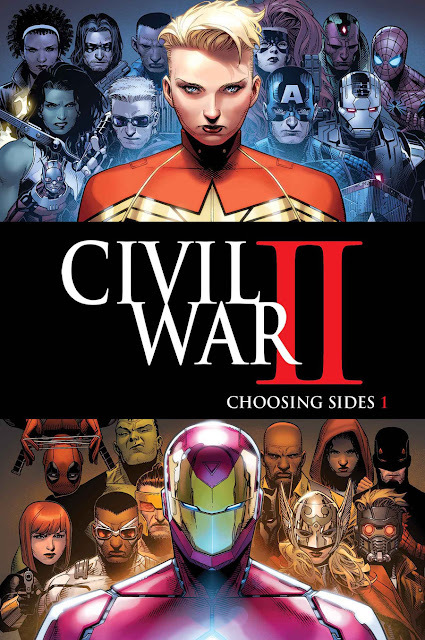 Also how interesting is it how's sided with Iron Man, and who's sided with Captain Marvel? I hope not Dale - the Vision is my top Avenger of all time, so I hope he emerges a hero. Will have to do so fast though,I'm pretty sure Tom has gone exclusive with DC. As for sides, tell me about it. Gut has me go for the team that has She-Hulk, War Machine and Captain Marvel (Monica) on it, but Daredevil (finally used in event promo art! ), Luke Cage, Falcon and Black Panther on Iron Man's side have me on that team's point of view before I even really know the details of the issue.